Recent research is demonstrating more and more clearly that the medical philosophy, which claims that our mental health problems are mostly determined by genetics and other mysterious biological factors, does not paint the correct picture. As a remarkable recent development, the prestigious Journal of Alzheimer’s Disease finally reported the role of a long list of infectious agents in Alzheimer’s Disease (AD) causation in April, 2016. While these reports signify a milestone in the deeper understanding of AD, it is important to note that scientific tunnel vision still prevails. One reason is that neurologists, microbiologists, toxicologists, and dentists conduct research correspondence in very different circles. Researchers today don’t like or don’t feel comfortable communicating meaningfully with other researchers outside of their narrow scope. This broader communication was more common fifty or a hundred years ago. We looked at dementia and Alzheimer’s with a holistic view – and the great results confirm that we’re on the right path. Take EMPowerPlus Advanced every day. Fully comprehensive, Alzheimer’s focused brain research has been delayed over the past decades due to pharmaceutical companies only focus on man-made, synthetic compounds (all drugs are neurotoxins – they are not nutrients) and due to various popular groups, including the ‘coconut oil/ketogenic diet group’, demanding more attention to their narrow interests than they really deserve. Others overemphasize the importance of one or more supplements and ignore other key aspects of brain health such as the calcification of the brain (surprisingly ignored by most), the bio-accumulation of toxins in the brain (routinely ignored even if aluminum, mercury and other metals are associated with brain diseases) or the the latent pathogenic microbes such as fungal pathogens feeding inside the neurons or bacteria reaching the brain from the mouth, from gingivitis. Others ignore that the brain shrinks 60% overnight, yes, sixty percent, for better overnight detoxification [3/a]. Yet, most so called detoxification experts falsely promote their unscientific, ineffective and dangerous daytime detoxification programs instead of a correct overnight detox program. Profit motives, greed and ignorance override patient safety and effectiveness. How much Alzheimer’s disease is fueled by pathogenic biofilms, likely developing first in the mouth as gingivitis, is rarely talked about. Neurologists, microbiologists, dentists and detoxification experts should collaborate like never before. Once it happens, there will be much more Alzheimer’s survivors. ApoE genotyping is sometimes used as an adjunct test to aid in the diagnosis of dementia and Alzheimer Disease but the likely biggest reason, the greatly decreased mercury, lead and other metals’ detoxification capabilities of the brain in people with APO-E4 allotype, is not pointed out – unfortunately – as the main reason for getting Alzheimer’s due to the higher accumulation of toxic metals! Those with APO-E4/APO-E3 and with APO-E4/APO-E4 allotype proteins in the cerebral spinal fluid are poor excretors of mercury, lead and other metals. These have the highest affinity for becoming ill from the bio-accumulation of toxic heavy metals and should extend their detoxification and build into their life a continuous detoxification to avoid dementia and Alzheimer’s. People with APO-E4/APO-E4 have an 80% chance of getting Alzheimer’s disease. But only a chance. Intelligent, preventative steps, when recurring overnight detoxification is built into a life-style, can stop the development of dementia or Alzheimer’s. Research has also shown that autistic children strongly-tend to have APO-E4 proteins. Sometimes it seems that there is an invisible wall separating the three main groups, the first one living in the world of prescription drugs, the second, listing food supplements as the solution for everything in the brain, and the third group advocating the removal of the toxins and pathogens before everything else is considered. As mainstream medical thinking is slowly catching up, another breakthrough study published in Aging in June, 2016 titled ‘Reversal of Cognitive Decline in Alzheimer’s Disease’, listed a few ‘hand picked’ patients who experienced significant improvements. However, while there were unprecedented improvements reported in a few patients, others didn’t respond so well. This deeper understanding fills the gaps other brain protocols often leave open by offering only an unbalanced approach. Likely, the most rewarding aspect of our Brain Protocol is that it delivers unusually positive results without having an individualized protocol that would require a strong and costly oversight by a specialist. This type of freedom empowers those living in a small village, far from a specialist, or for a city dweller lacking the funds to pay the doctor (and rather put those funds towards actual products instead). The status quo rejects this type of decentralized freedom as successful lobbying resulted in government enforced privilege where medical knowledge is sold for profit. Could Most Brain Disorders Have Similar Causes? Dr. Thomas Janossy, a former neuroscientist, had a theory that all brain disorders are basically the same with a few exceptions which are genetically induced such as Downs’s syndrome, or which are caused by trauma to the brain. These four factors effect different parts of the brain, often with characteristic clinical symptoms. Damage to the brain’s neurons in the frontal and temporal lobes causes forms of dementia called frontotemporal dementia. When the middle third of cortex has decreased blood flow and elevated inflammation, its typically associated with Alzheimer’s disease or pre-Alzheimer’s disease in the younger generation. When the back third of the cortex has reduced blood flow, its associated with Dementia with Lewy bodies (DLB), hallmark of Parkinson’s disease, but often found in Alzheimer’s disease. The downward spiral usually starts by changes in the gut flora as toxins accumulate and inflammation is triggered, resulting in a weakened immune system (the immune cells are toxic too) that gives a chance for the pathogenic microbes to get the upper hand. It’s not widely mentioned, but dementia and Alzheimer’s disease starts in the mouth and the gut as most bacteria and toxins enter the body trough the oral route. The majority (60% to 70%) of the immune system depends on the health of the gut. Chances are that whenever the causes of a mental illness is unknown, the focus should be on toxic synergy and pathogenic synergy as the most likely causes. The outstanding results of our protocol further reinforces that this novel approach deals with the real causes. The protocol is a ‘full protocol’ that covers most aspects of brain health. Extra energy is maintained by the ketogenic diet to support both the detoxification and brain rebuilding parts of the protocol. Ketons, such as coconut oil and MCT oil (medium-chain triglyceride, 60% of it is coconut oil) produce significantly more energy than glucose. Ketogenic diet should be maintained while the protocol is followed since the triglycerides give fuel for the nerve cells independently from insulin or the health of insulin receptors in the brain. Under-performing nerve cells can regain some of their functions on a ketogenic diet. Ketons help with the production of more ATP, the energy units in mitochondria, than glucose. Full detoxification and rebuilding is needed for increasing the chances of brain recovery, realistically achieved only if the toxic and microbial load is lessened and new neurons are formed. It is unreasonable to expect that the brain would regain healthy functioning on its own without outside help and without (overnight) detoxification. Increasingly, it’s recognized that higher toxic levels are linked to chronic diseases as we try to function with 80.000+ man-made chemicals in the environment, 700 contaminants in the average adult and 200+ industrial chemicals and pollutants in the umbilical cord blood in the newborn (most of them are cancer causing). The difference, the 500 extra toxins are picked up over a lifetime. More than half of the 700 toxins an adult has have neurotoxic effects. The specific neuronal damaging effect of the bio-accumulated toxin, such as mercury, lead, or pesticides; the actual amount of the most damaging toxins; and the synergistic interactions between these toxins trigger a series of cascading events, leading to a weakened immune system, that leads to the manifestations of a well-defined brain disease later on or actually several diseases at the same time. Both EDTA and Glutathione should be key components for a deep-cellular, systemic overnight detoxification program when all of the toxins, including neurotoxins are targeted for removal at the same time. Our protocol targets all of the toxins for removal since glutathione removes all toxins. Most toxins are neurotoxins and should be eliminated from the brain. ToxDetox is the first and only product currently on the market worldwide that has both EDTA and Glutathione in highly effective synergy, resulting in the excretion of over three times more toxins (3.8X) than with EDTA alone or Glutathione alone. Mercury, lead, aluminum, pesticides, fungicides and in fact all toxins are excreted with the help of EDTA and Glutathione synergy. The normal and natural detoxification of the brain happens overnight when the brain shrinks 60% and not in the middle of the day. Most ‘big-name’ detoxification experts FALSELY promote a day-time detoxification program that is inferior and much damaging compared to night-time detoxification programs that are safer and way more effective. Even a child knows intuitively that the night-time is for detoxification and rebuilding, yet, the cynical ‘day-time detox experts’ ignore these, causing negative effects, painfully slow detoxification and secondary problems. Somehow in the US, if business is good, everything is accepted, even scientific dishonesty and poor clinical outcome. It is not widely known, yet the most important innate compounds for the natural detoxification of the brain are melatonin and Glutathione. Actually, it is quite interesting that melatonin triggers increased level of Glutathione. However, in every chronic conditions, including all of the neurodegenerative diseases, the level of Glutathione is low or extremely low (such as in Parkinson’s). Glutathione1.5 (strongest ever, 1500 mg reduced glutathione) is widely used to improve Parkinson’s patients instead of intravenous (IV) Glutathione. While Glutathione is the body’s most important antioxidant, used up also to fight free radicals, the supplemental Glutathione also boosts the immune system. Why Overnight Detoxification is so much better? The overnight detoxification is extremely important. Day-time detoxification is ineffective, and poses a great danger to the individuals. A French study clearly showed that when a specific toxin was given, on a high enough level, it killed ALL of the research animals. When the same high level was given to a different group of rats overnight, none of them died. Naturally, most people would vote to be in the overnight group where there was a 100% survival. Yet, the majority of people select a daytime detox program. The circadian rhythm plays a neglected, yet, key role in detoxification. The sympathetic nervous system activates and maintains in the daytime the body’s ability to ‘fight-or-flight’ and prepares the body for physical and mental activities. Overnight, the parasympathetic system slows down most functions of the body, the temperature, the heartbeat, and the circulation is more balanced. The body needs the whole night when free radicals are reduced, antioxidants are elevated, most notably melatonin and glutathione, to rest, digest, detox, rebuild and heal. Detoxification is a parasympathetic event that naturally happens overnight. But fraudulently, ‘detox experts’ aggressively override the body’s natural cycle and force detoxification on unfortunate patients in the daytime. Somehow they think that if they don’t talk about the correct, deep-cellular, overnight detoxification than it goes away. After all, ignorance and the ‘almighty’ profit speaks louder than anything else. It is truly sad when fast talking ‘detoxification experts’ get away with damaging the lives of hundreds of thousands of people worldwide. Beware of the ego-driven ‘experts’ who dishonestly mislead the masses. Detoxification is further enhanced in intermittent fasting or in extended fasting – when fasting happens over 24 hrs. We should look at fasting as an extended, overnight and slower metabolic state and also a time when fat cells are opened up to be used for energy by the body. Consequently, the fat soluble toxins are released at the time of fasting. This is an extra reason why fasting and detoxification should be done concurrently – to capture and remove the released toxins flooding the body from stored fat. It is suggested that Stemdetox, ToxDetox – comes with charcoal/StopReabsorb – are used also on fasting days. It remains yet another mystery why most Alzheimer’s specialists and brain protocols totally ignore the calcification of the brain, a known contributor in neurodegenerative conditions. Somehow, both alternative and allopathic/mainstream medical thinking get away with the notion of not mentioning the paramount importance of nighttime detoxification and brain de-calcification. Millions of people suffer due to this unprofessional ignorance. Alzheimer’s patients have been observed to have a higher degree of pineal gland calcification than patients with other types of dementia. Besides the pineal gland, the brain’s primary structures are also negatively affected by calcification, namely the habenula, choroids plexus, superior sagittal sinus, basal ganglia, falx, dura mater, and tentorium cerebelli, as well as the petroclinoid ligaments. Two-thirds of the adult population has calcified pineal gland, reducing this gland’s ability to create melatonin. Low melatonin levels drive Glutathione levels down and this could explain why Alzheimer’s patients have both low melatonin and low Glutathione levels (and sleep disturbances). One early indication of dementia and Alzheimer’s is poor sleeping patterns that is also one of the early signs of calcification. Calcification happens everywhere as calcium phosphate crystals build up in various parts of the body that is caused primarily by nanobacteria but also by Chlamydia. By building calcium phosphate shells around themselves, bacteria enhances its protection from the immune system – a brilliant tactic for their survival. Our program targets simultaneously both these pathogens and the removal of the calcium. The human pineal gland is ‘outside’ the blood-brain barrier and this could be the reason why pathogenic microbes can attack it earlier and easier than other parts of the brain. De-calcification of the pineal gland and in fact the brain and the whole body is a key part of our Brain Protocol, accomplished with EDTA and also K2 vitamin, found in StemDetox. All of us, without exception, have circulating microbes, viruses and fungi in our blood. However, the damages these pathogens might cause are not measurable while the immune system is strong. Usually microbes remain dormant over many years. However, reactivation can occur after stress, when the immune system is suppressed or during aging. This reactivation is similar to the appearance of herpes virus under stress. Likewise, all of us, without exception, have cancer cells in our body but the immune system is able to eliminate and kill those cancer cells (apoptosis). The question is only the combination and specificity and synergy of the microbes (and toxins) that emerge when the immune system becomes weak. Microbes prefer to work together in synergy, called pathogenic synergy, to weaken their host. In chronic conditions most microbes favor living in biofilm communities that give extra protection for them both from the host’s immune system and the antibiotics or any other herbal supplements targeting them. This pathogenic synergy results in the production of neurotoxins that further accelerates the cascading events the synergistic toxins initiated. Biotoxins, produced by pathogenic microorganisms, are usually more toxic than man-made ones. It is well known, especially by Lyme patients, that biofilm communities are highly resistant to (herbal or synthetic) antibiotics. Biofilm is such a major concern that we developed a novel anti-biofilm protocol that is widely embraced by Lyme patients and others struggling with a biofilm related chronic condition. Pathogenic synergy can’t be treated in a piecemeal fashion, but rather, as one condition, with one approach that targets simultaneously all of the pathogenic microbes. Otherwise, we might give a chance for a microbe over another infectious agent, similarly when Candida often flares up when an antibiotic is taken. Other protocols routinely ignore it but our protocol also targets parasites since these pathogens can also cause memory loss and cognitive decline. Viruses are similarly ignored, yet, play a central role and can even form a biofilm alone. Our antiviral tool-box includes Glutathione, Se (selenium), black cumin, Flavin7 Gold, garlic, oregano and other ingredients. The anti-fungal aspect of our protocol also plays an important role in its effectiveness. A 2015 University of Madrid study showed that 100% of Alzheimer’s patients had fungus in their neurons while the controls had none. As a stunning rehabilitation of beta-amyloid (Aβ), the ‘bad boy’ hallmark of Alzheimer’s disease that thought to cause neuronal damage, Harvard researchers describe its role as a natural antibiotic (!). Aβ forms insoluble aggregates in the brains of patients with AD and its propensity for aggregation are still widely viewed as intrinsically abnormal. However, in new work, Kumar et al. show that Aβ is a natural antibiotic that protects the brain from infection. Most surprisingly, Aβ aggregates trap and imprison bacterial pathogens. And according to study author Rudolph E. Tanzi, Ph.D., of Harvard Medical School and Massachusetts General Hospital, “each plaque had a single bacterium at its center.” Mice that didn’t produce beta-amyloid were at greater risk of dying from the infection and did not have any plaques in their brains. If Aβ has a powerful protective role against invading microbes than why on earth any doctor would give to any patient a drug that helps with the removal of Aβ? If Aβ is a sign of invading microbes it would be more logical to give to the patient some anti-microbial, right? Anyhow, the illogical treatment protocols of mainstream medicine is yet another reason why ‘officially’ there is no chance for an Alzheimer’s patient to be cured. Dementia and Alzheimer’s survivors are found far away from mainstream medicine. The third part of the protocol gives relief to the brain as the toxic and microbial load is lessened. It is unreasonable to expect that the brain would regain healthy functioning on its own without outside help. While the bio-accumulated toxins often damage dis-proportionally certain specific organs or cell groups, even in the brain, they also hinder the absorption of key nutrients from the gut by either occupying receptor sites or by producing a high level of free radicals that contribute to permanently high inflammation in the gut and in fact in the whole body, including the brain. As the pathways for the absorption of nutrients from the gut to the cells are disrupted, the cells, including neurons, cannot get the required nutrients and start losing their ability to maintain the required homeostasis, necessary for survival. A poor diet can lead to a range of nutritional deficiencies. Common nutritional deficiencies include magnesium, zinc, iodine, vitamin D (should be taken together with vitamin K2), omega 3, B vitamins and selenium. The Brain Protocol picked the most studied nutraceutical providing well balanced brain micronutrients. 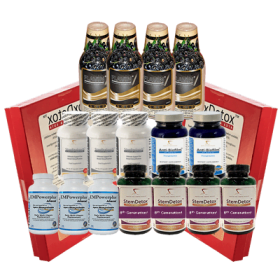 EMPowerplus Advanced is a remarkable supplement for brain health and well-being. A healthy body depends on healthy microbes in the gut. The good bacteria in the gut protect us from infections, break down the nutrients, produce vitamins, keep our immune system healthy, and maintain life. Once the toxins and the pathogenic microbes damage the healthy microbes in the gut, Candida, parasites and other opportunistic pathogens get out of control. As the first layer of protection, the wall of the gut is breached (leaky gut), both the toxins and pathogenic microbes have suddenly access to the whole body, with far reaching consequences. Without a healthy gut there is no healthy immune system and no healthy brain. The Brain Protocol supports the formulation and maintenance of the healthy microbes. To reverse the typical down-world spiral in the gut, the toxic load inside the lumen of the gut should be reduced, Candida and parasites killed, inflammation reduced, and good bacteria replenished. Fasting reduces the prevalence of pathogenic bacteria as the beneficial bacteria multiplies. This shift in the gut is an amazing benefit of fasting that should motivate all of us for multiple-days, extended fasts. Elevated level of circulating stem cells in the blood and longer telomeres are the hallmarks of longevity and important for brain health. Strangely, companies often urge their customers to take the stem cell enhancing products for life without any concerns about the weakening and depletion of the bone marrow over time, while the ability of Stem Enhance or other similar products to produce a sustained release of stem cells over the years has never been shown. Furthermore, the medical literature on aphanizomenon flos-aquae (blue-green algae) revealed that 97 of 99 bottles of blue-green algae analyzed by independent researchers have been found to contain a microtoxin capable of causing liver failure. The most concerning toxins are the hepatotoxic mycrocystines that accumulate in adults and passed on to their offspring. Clearly, there has to be a better way to increase stem cells. Our new theory was simple. What if the bone marrow is detoxified to support the production and maintenance of healthier stem cells – with longer telomeres. Thus, StemDetox was born, and became our bestselling product. Prolonged states of decreased glucose availability induces ketosis, a natural physiologic state. It is triggered by severe caloric restriction or when carbohydrate intake falls below 20-30 grams (most of the current low carbohydrate diets are nowhere near this level of restriction). Ketosis is usually achieved by the second day when fasting on water alone. A ketogenic diet requires 50 to 80 percent of calories coming from special fats such as coconut oil, MCT oil, with carbohydrate and protein restriction. This forces the body to shift toward using ketones as its primary fuel source, instead of glucose. Medium-chain triglycerides (MCTs) are made up of medium-chain fatty acids with 6 to 12 carbons. The “medium” refers to the length of their chemical structure. Short-chain fats (e.g. butyric acid) have fewer than 6 carbons and long-chain fats (for example, the long-chain polyunsaturated fats EPA and DHA) have 13 to 21. MTCs are so powerful that adding them to your diet can actually increase the number of carbs you can eat while staying in ketosis. They are the ultimate ketogenic fat. There are many benefits for reduced calorie intake (by 25% or more). Calorie restriction modifies some risk factors for age-related diseases and influences indicators associated with longer life span. Calorie restriction significantly lowers several cardiovascular risk factors, lowers levels of the inflammatory marker C-reactive protein and decreases insulin resistance, an indicator of diabetes risk – all factors supporting brain health. Alzheimer’s is also called Type III diabetes. Benefits of fasting are numerous and well documented. Intermittent fasting – when the eating window is reduced, alternate day fasting and extended fasting are all benefitial for most people. Full fasting is water only fasting. Extended overnight fasting triggers ketosis, when no food is taken for at least 16 hrs, and this provides the basis of our recommendation that food should be consumed only between 10am and 6pm (16/8) or even better if the eating window is shorter, between noon 12pm to 6pm (18/6). Ideally, fast and feast, caloric restriction or actual water fast (zero food intake with water consumption only) should be mixed. Water fasting on Wednesdays and Fridays, when only a very small amount of food, is an age-old tradition of fasting that is beneficial both for the body and the soul. Feast days are the rest of the days of the week when all (healthy) food can be taken, however, ideally only within the window mentioned previously (noon to 6pm). Likely, green juicing as a type of fasting is more tolerable, especially for those who have elevated toxins. Fasting causes fear in some people, like stepping into a frightening unknown. As a disclaimer, we should mention here that fasting should be started when advised by a licenced health care provider. Fasting is not advised for pregnant women, children, the elderly or those who have a serious medical condition. However, individual cases were reported that fasting turned around individuals who were about to die, such as a person who had diarrhea and bleeding. Others, such as Jason Fung, MD, cures type II diabetes by fasting, usually between 5 to 18 days. Fasting improves insulin and leptin sensitivity. Most chronic conditions respond vary favorably to fasting. Lower risk of heart disease and stroke can also motivate some people for fasting. Extended fasting can deliver one of the most profound changes that turns back the biological clock, fixes nagging chronic conditions, and can even reduce the chances of getting cancer later in life. Some people fast for reduced belly fat or for general weight loss. Others fast as part of a smart, whole body detoxification. Fasting and detoxification are inseparable. Once we recognize this link, fasting should be supported by binding agents both in the blood where the extra toxins show up first (glutathione, EDTA) and also in the gut (charcoal/StopReabsorb). Sadly, most ‘fasting experts’ ignorant about how to deal with the extra toxins when fasting. Yet, the binding and removal of toxins are critical for accelerated detoxification and for gaining more benefits from fasting. We consider fasting to be really effective if it is a water only fast for 6 or 7 consecutive days. Some teas or a small amount of soup (e.g. bone broth) might be consumed, but zero sugar and no carbohydrates or proteins. The liver can turn proteins into glucose. Full fast is a water only fast. Partial fast is when something else, anything else is also consumed, including bone broth. The most important goal is that the body should remain in a 100% keton based metabolism in extended fasting. If you are new to fasting, gradually reduce the food intake, just before you start fasting. Or try gradually narrowing the eating window over a couple of days. The first day of water only fasting is usually well manageable. Always drink lot of water when fasting. The second day is likely the most difficult to go through when the glucose metabolism switches over to keton based metabolism and hunger becomes stronger in waves. It is a good strategy to drink two to three glasses of water when hunger pangs are strong. These hunger waves go on only for a short time, typically for a half an hour to an hour. If a work is done or anything else that require our full attention, it is easier to suppress these hunger waves. After the third day of fasting on water alone, the hunger waves usually dissipate and a remarkable state is achieved when no food is desired and a new, unknown type of enthusiasm is experienced. A new kind of lightness and love of life. Use the sacrificial aspect of fasting for a higher purpose. Offer up the discomfort for world peace or for the protection of your loved ones or for stepping into a deeper, loving connection with God. Don’t waste the spiritual aspects of fasting. The stem cells are greatly elevated after the second or third day of water only fasting and often an accelerated healing of nagging chronic conditions improve greatly. The immune system also freed from its work linked to the digestion of the food. The combined effects of much lower inflammation, high stem cell count, autophagy – when the cells recycle or remove damaged parts, and enhanced detoxification creates the ideal environment for the renewal and healing of the whole body, including the brain. Autophagy is highly beneficial in Alzheimer’s disease [6/a]. If you still want to do a beneficial extra step, do a so called ‘dry fast’ on day six when you don’t consume any water for 24 hrs or more, e.g. for 36 hrs. This type of fast is much easier to do when on a keto diet or when your body fully switched over to burning fat (typically accomplished by day 4) as your body produces metabolic water from fat. There are multiple benefits, such as the fastest way to loose weight, the fastest way to reduce inflammation, the fastest way to dump toxins, the fastest way to calm and heal the digestive track, and the fastest way to accelerate autophagy and further elevated stem cell count in the blood. After the fasting days, you should eat less for about half the number of fasted days. Break your fast with a small smoothie or with a small meal, preferably should be ketogenic diet with some undigestable cellulose to help with the motility of the food in the gut. Eating fermented food is a good idea (sauerkraut, kimchi/fermented cabbage). Observe a young child carelessly playing in a kinder garden. The child often runs from one toy to the next one, actually doing intermittent cardio that is healthy and builds up the muscles, joints and bones. Tennis is a good example that accomplishes something similar. Even if there is no time for the gym, isometric exercise can be done anywhere as various muscle groups are repeatedly contracted without actually moving an arm or leg. You can sit in your car or in your office and could pull in your stomach repeatedly or tighten various muscle groups such as pushing your knees together or push against an unmovable object for two times 10 minutes daily. This is called isometric exercise when no big movement is visible, yet you do exercise. There are many benefits, including the release of IGF1 and TGF1 that triggers the regeneration of the brain, including the hippocampus, a brain area extremely critical for learning and short term memory, especially vulnerable to damage (brain shrinkage) at early stages of Alzheimer’s disease. By using medical terms, Growth Factors are critical for brain plasticity and for promoting cell survival, neurogenesis, differentiation, axon outgrowth, dendritic growth and maturation, synaptogenesis, and activity-dependent synaptic pruning. The blood-brain barrier is part of the immune system, specific for the brain. While the star-shaped astrocytes have an executive-coordinating role in the brain, their activity is also linked to the maintenance of healthy blood flow and the blood-brain barrier and they are also tasked to repair and replace damaged neurons. Consequently, it’s being stipulated that the level of toxins (environmental or bacterial neurotoxins) reach a critically high level that damages the neurons in the brain about 20 years before Alzheimer’s is diagnosed. Furthermore, it’s increasingly assumed that the earliest damage to the brain might be associated with very mild dementia or headache and these still small changes should actually signal the need for a robust preventative brain protocol. 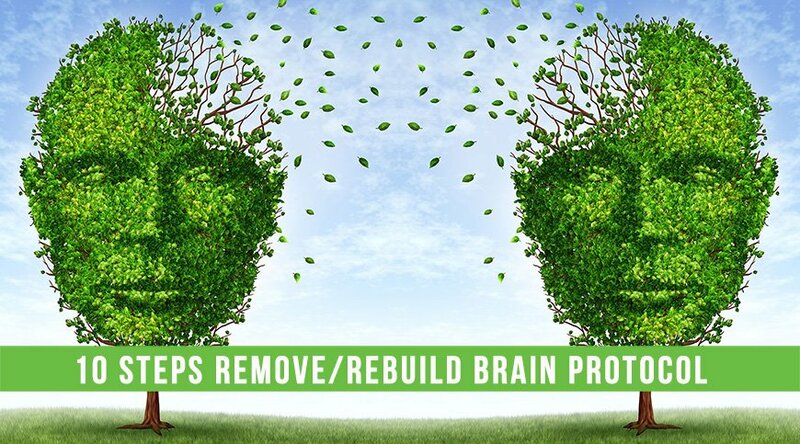 Our 10 Steps To Remove/Rebuild Brain Protocol was also developed to be used as a tool to avoid chronic, neurodegenerative conditions, including Alzheimer’s and Parkinson’s. The earlier is the removal of the toxins, the pathogens, the calcification and the earlier is the rebuilding of the brain, the better are the chances for the maintenance of healthy brain and aging without the occurrences of neurodegenerative diseases. Take coconut oil every day to increase the energy level of neurons. Start slowly, with about a half or a full tablespoons daily of coconut oil in your soup, smoothy or any other food. About one in four persons have some digestive problems, maybe diarrhea, when they start taking coconut oil or MCT oil and they can’t take too much too soon. Take it with food to reduce the possibility of these problems. The goal is to reach about daily four to six tablespoons. Coconut oil could be added to oatmeal since at room temperature coconut oil is solid in its consistency. Two tablespoons equal about 35 ml or 35 grams that yield changes in behavior in dementia or Alzheimer’s. Build it up slowly to about ten tablespoons when the brain damage is severe. Coconut oil has the peak effects about three hours after consumption and the ketons are provided for six or seven hours long. It doesn’t really matter if its refined or unrefined, virgin or not virgin, organic or not organic, you would get the same effects on the brain as the ketons are the same in all type of coconut oils. However, organic is preferred and unrefined has more nutrients in it. But refined is usually deodorized and this is a better choice for those who don’t like the taste and odor of coconut oil. If you cook with it, use medium heat, 350 Fahrenheit or less, to avoid it to smoke and to avoid altering the structure of the fat. It melts at about 75 to 76 degrees, below this temperature it becomes solid. For breakfast you could cook your eggs in it, add into a smoothy, or for lunch you could add into a soup. Coconut milk, maybe with an equal part coconut water could be mixed and added to a smoothy or used instead of cow milk as the consistency is quite similar, yet contains ketons. Five ounces from this mix delivers about a tablespoon of coconut oil. By eating a third cup of coconut flakes, often eaten as snacks without anything else, you get about a tablespoon coconut oil. Finely shredded coconut flakes could be put into yogurt. Coconut flour has some carbohydrates in it but its 75% fiber. Great for wheat free brownies, cookies, and its gluten free. MCT oil actually delivers more ketons to nerve cells much faster as the levels peak in about 90 minutes but the levels also drop faster and disappear in three hours. The max safe temperature to cook with it is lower, about 320 Fahrenheit. MCT oil is odorless and tasteless, can be used for salad dressing. MCT oil is thermogenic, increases body temperature, and is used for weight loss, especially in Japan. And in the U.S, its used by body builders to increase body mass as muscle uses the MCT oil directly. Ideally, both coconut oil and MCT oil should be used to get their benefits. An option is to mix them together at home, half and half. This mix remains liquid at room temperature. Consider taking StemDetox for two months and at that time switch over to Anti-Biofilm. When finished with the first bottle of StemDetox, introduce ToxDetox (Glutathione and EDTA synergy) chelation suppositories while continuing to take StemDetox. Take ToxDetox every second night for a minimum two months, depending on age, medical history, toxic exposure and your chronic challenges. Keep taking Anti-Biofilm every day, after the course of StemDetox is completed. Take over 1 gram (2 capsules) StopReabsorb/Charcoal daily from day one. Daily charcoal increased laboratory rats’ healthy life-span by an extra 40%. Daily charcoal is the best kept secret for good health and longevity and it’s not interfering with nutrient uptake (otherwise, the rats couldn’t have a 40% longer healthy lifespan). There is no evidence or study showing that charcoal robs the body from nutrients. Drink 10ml (5ml in the morning and 5ml in the afternoon) Flavin7 Gold daily. There is 200ml in a bottle. Extend your night fast by eating only between 10am to 6pm. Enjoy your fast but also your feast days! You will also lose some weight as an extra bonus. Have your morning 5ml Flavin7 Gold with a few cups of (organic) green tea instead of breakfast. Eat for lunch sauerkraut (full with prebiotic, probiotic and healthy bulk) and maybe an apple with almond cream and more green tea (we also have prebiotics and probiotics in StemDetox). Take your Omega 3 as usual. Omega 3 could be replaced by Krill oil that is omega 3 plus astaxhantine (no worries though – we have astaxhantine in StemDetox). The ‘success’ of this powerful protocol is mainly dependent on your ability and willingness to go through the steps and persevere. Incorporate fasting into your routine – read more about fasting further up. Take half the suggested dose on the days of fasting. However, you can take daily a ToxDetox suppository when fasting to support the accelerated detoxification. There is nothing more liberating than changing around your life for the better. This entry was posted in Protocols and tagged Alzheimer's, anti-biofilm, immune system.